On this page you will find a summary, video and practical resources that link to Level 2C. At Level 2C, readers are managing text with more difficult and less familiar vocabulary. The reading tasks require the reader to move beyond the simple “scan and locate” tasks and use more critical thinking. Finding information at this level is more complex because the text is longer or the vocabulary has a higher level of difficulty. Please note the following links will display Level 2C content of the resource. Look at “How to Benchmark Materials“ to learn how to benchmark your own learning materials for level 2C. 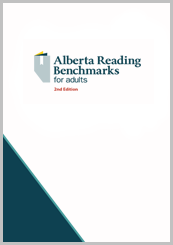 This resource provides an introduction to and overview of the Alberta Reading Benchmarks. It provides an in-depth description of the ARB levels. 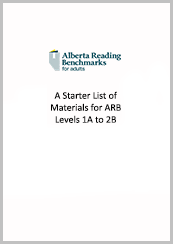 This resource provides a list of reading materials benchmarked to ARB levels 1A to 2B as well as teaching strategies and learning activities.